09 Dec What does it mean to be fit? As a personal trainer I always ask my client for her/his goals. I often get to hear that she wants to be as fit as she can be. At other times I hear people compare athletes from different sports with each other and how one athlete is fitter than the other. Fitness is a vague term and cannot be entirely nailed down. At the same time, when you are looking to work with a personal trainer it is important that you know what you are aiming for, what your definition of fitness is. A sprinter, a marathon runner, a weight lifter or a basketball player, they all require a certain fitness that pertains to their sport and their goals. It is really hard to compare them with each other though. All of them have a very specific goal and the adaptations in their body aim to improve on what is necessary to have a better performance. A true sprinter will not be able to run a marathon and the marathon runner is so slow over a 100 m dash that you can drink a coffee. Why? Their muscles have adapted to the requirements of their sport. If you want to get fit, then you have to find out what that means for you. Do you want to acquire what I call a general fitness, meaning, improve your cardiovascular fitness (in this case endurance >30 min), your strength, even some of your sprint ability? Then you need to understand that you cannot be great at everything. Up to a certain point you can improve on all of those but there is a turning point where you will have to specialize in a discipline in order to keep improving. Why is that? Because sometimes the required adaptations contradict each other. Take me for example: I want to be stronger, be more explosive, run marathons and do martial arts. Well, good luck with that! I have become faster in my marathons, I have become stronger and faster for my martial arts but… I will level out. Someone who runs long distance trains slow twitch muscle fibers, someone who sprints, fast twitch muscle fibers. 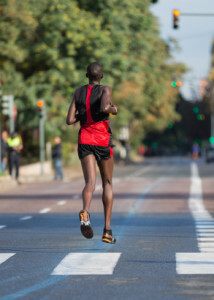 A body running long distance cannot carry a lot of muscle and stay fast. There is an optimum. 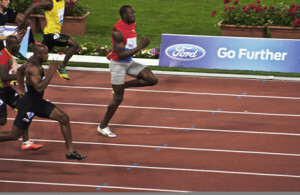 At the same time a sprinter needs fast twitch muscle fibers that are able to contract explosively and generate more force than slow twitch muscle fibers. Those muscle fibers are bigger if trained. I know I will never be as fast a sprinter, a marathon runner, or as strong a lifter as if I specialized on one thing only. I am getting better at all of it, but it takes longer which I am okay with. Even if you consider being a specialist, you still need to cross train in other areas because they can help improve your performance up to a certain point. Most of our clients look for general fitness, some are specialists. We make sure our personal training is catered to the specific needs of our clients. I hope this article was able to help you find out what you are looking for and help you understand the importance of knowing your goals.